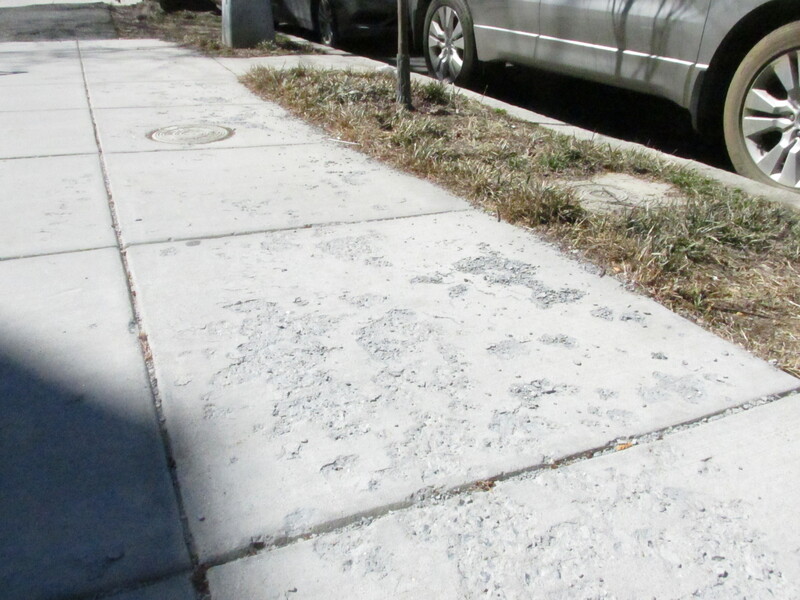 D.C.’s Flaking Sidewalks, and How DDOT is Working to Fix Them | Park View, D.C.
Each spring, I’ve noticed that the sidewalks that have been replaced in the last couple of years are in a state of disrepair. Large sections of them show flaking and crumbling. Knowing that we are scheduled to get some new sidewalks in the neighborhood this year, I asked DDOT for more information on the scaling issue and if our new sidewalks would continue to deteriorate. The District maintains over 1,600 centerline miles of roadway. Many of these roadways have sidewalks on both sides. We noticed that some sidewalks in the district had shown flaking and delamination. This sidewalk concrete issue is not restricted to the District and is in fact regional. (d) exposure of an inherently poor quality and/or poorly constructed concrete to deicing salts. (b) Took concrete cores and performed petrographic analysis. The resurfacing with the product to seal and resurface segments of the sidewalk was conducted in August 2014 and its performance will be evaluated this summer. The sidewalk concrete cores from Riggs Road were evaluated at the federal Turner Fairbanks Research Center in Virginia. The finding from the report indicates that the cause of scaling of the sidewalk was most likely related to poor-air void system in conjunction with improper finishing (premature finishing of the surface before bleeding was completed) of the surface. This surface was then exposed to winter conditions (freezing and thawing in presence of deicing salts, and accumulations of snow and ice), particularly the severe winter of 2013-2014. DDOT has initiated a citywide survey of the condition of sidewalk concrete and if the trial at Riggs Road, NE, is successful, a city wide repair task will be planned and scheduled. In order to minimize such issues in the future, we have assigned an experienced engineer to vigorously inspect all constructions sites on a daily basis and enforce the Standard Specifications requirements, and any non-complying concrete, asphalt and other construction materials are rejected and replaced with approved materials. Furthermore, quality control managers of concrete producers are required to test and document concrete for slump and air content before it leaves the plants. This entry was posted on March 31, 2015 at 7:01 am and is filed under DDOT, Restoration repair and maintenance. You can subscribe via RSS 2.0 feed to this post's comments. Thanks, Kent. I’ve been wondering about this. I have assumed DDOT has been skimping on materials and workmanship. New sidewalks near my house which were not salted this winter (because they are not in front of a house) are still flaking away. The new concrete walk in my backyard weathered our winter just fine. I’ve been meaning to bring this up for a while and this seems like a good time for it. I’ve noticed the concrete sidewalk problem for a while now, and was wondering how a block or neighborhood goes about getting brick sidewalks. I’ve noticed that the sidewalk in the West side of Park Pl. North of Rock Creek Church Rd. has brick for about a block or so, and despite the salting and the same freezing/thawing conditions, those sidewalks are still in perfect shape. Considering there are so few street trees in Park View that could potentially push the bricks up and cause problems, I thought our neighborhood would be a great candidate for brick. Depending on the cost and amount of labor needed to fix the already degrading sidewalks, I’m wondering if for long-term cost it wouldn’t be better to switch to brick. Interested to hear what others think of this. DDOT subcontracts the installation of sidewalks and based on their response above they have “Standard Specification requirements” that the contractor needs to meet in order to be in compliance. Every explaination above (even the “salt did it”) comes down to flawed installation. This issue screams for a proper Inspector General investigation and force the contractor to replace these flawed installations. It is absurd that DDOT and the taxpayers are going to pay to install these sidewalks once and then pay to fix them because of flawed installation. The DDOT response details the installation failures. I am sure the contractor will rely on a clause that absolves them of liability after DDOT “accepts” the deliverable, but there is no possible way these spalling and flaking sidewalks were installed according to the Standard Specifications and these failures are not immediately detectable. The contractors should be immediately banned from DDOT work until they replace their own shoddy work.